A few years ago we published an article about parents, exam results and social media. It caused rather a stir. The original piece, an exploration of the pros and cons of posting one’s children’s achievements online, was taken up by, among others, the Evening Standard and the Daily Mail. Hacked about and stripped of nuance, it was repackaged as: ‘Evil feminists say we shouldn’t be proud of our children!’ Okay, that might not have been the exact headline, but it wasn’t far off. One of the more memorable ‘below the line’ public comments also accused us of being personally responsible for closing down children’s playgrounds in the name of ‘health and safety’! But like the annual public hand wringing about whether results are better or worse and exams are hardier or easier, the questions we raised in that article haven’t gone away. If anything, opinions and behaviour are more polarised. Public exam results were once, despite the name, a relatively private matter. Beyond family, school, university or prospective employers it was up to the individual who they told about their grades. That is no longer the case and it seems parents, not children, have changed the game. We all know someone who will work a conversation round so that they can ‘casually’ drop in their child’s latest achievements. We also know plenty of people who don’t feel the need to reciprocate. Social media hasn’t caused parents to become more boastful (we’re all proud of our children) – it just looks that way. Why? Because we’re not always terribly good at it. Unlike most parents, children are highly sophisticated users of social media. They may have Facebook, but how many do you know who post anything remotely personal? It’s not Peter gushing ‘Proud mummy moment, he’s off to Cambridge!! !’ to friends of friends of friends. It’s not Jane broadcasting to the world, ‘Ten A*s!! Hashtag ‘so blessed’!! Jane and Peter are probably not even friends with their parents on Facebook and do not follow them on Instagram. Jane and Peter maximise their security settings and communicate with their friends privately via WhatsApp or Snapchat. Jane and Peter understand memes. 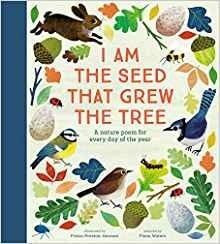 Our choice for August is I am the Seed that Grew the Tree: A Nature Poem for Every Day of the Year (Nosy Crow in association with the National Trust, £25). Take our word for it, I am the Seed that Grew the Tree is one of the most stunning books of the year – a book that children and adults will return to again and again. Named after the first line of Windsong, a poem by Judith Nicholls, it’s a beautifully illustrated collection of 366 nature poems. In other words, there’s a poem for children for every day of the year, including leap years. The poems were selected by anthologist Fiona Waters and range from old favourites like William Wordsworth’s Daffodils to more recent choices, such as Moth by poet laureate Carol Ann Duffy and That Stormy Night by Berlie Doherty, each one illustrated by artist Frann Preston-Gannon. The book features a total of 185 named poets, including William Blake, Emily Bronte, Walter de la Mare, Emily Dickinson, Robert Frost, Thomas Hardy, Ted Hughes, Roger McGough, Christina Rossetti and John Updike, as well as a host of anonymous poems and rhymes. There are poems about animals, birds, plants and trees and verses about the weather, the seasons, sunrises and sunsets. Nosy Crow publisher Kate Wilson says that this is the book she is most proud of publishing in her 30-year career and in our view her pride is totally justified. As she explains in the introduction to the book children can read it from cover to cover, read a poem every day, learn a poem by heart or enjoy the poem chosen for their birthday. “If you enjoy it half as much as we have enjoyed making it, then we will have done what we set out to do,” she says. I am the Seed that Grew the Tree is a rare find, a classic that children will cherish for years to come. Choosing Chinese. Chinese is now a more popular A level than German. This year a total of 3,334 students took Chinese A level, compared to 3,058 who did German. Entries for Chinese have increased by 8.6 per cent since last year while German entries declined by 16.5 per cent. Stormzy scholarships. Musician Stormzy plans to fund two black British students to study at the University of Cambridge. He will pay tuition fees and provide a maintenance grant for up to four years of an undergraduate course. Under the microscope. A growing number of teens are taking science subjects at GCSE. This year more than half a million 16-year-olds took science in one form or another, with record numbers taking separate sciences. A total of 160,110 pupils in England took chemistry, for example, compared with 53,309 in 2008. Uni sceptics. The number of youngsters who are sceptical about going to university has increased over the last six years. New research by the Sutton Trust found that three-quarters of 11 to 16-year-olds reckon higher education is important. The figure is down from 78 per cent in 2017 and 86 per cent in 2013. Nursery staff fears. Save the Children has warned that more than 300,000 children are being taught by unqualified nursery staff, amid concerns that some start school without the early speaking and reading skills they need. Attainment gap. Analysis by Teach First shows that poor pupils are more likely to be excluded from school than pass the five English baccalaureate subjects of English, maths, a science, a language and history or geography. The charity found that 10.3 per cent of pupils on free school meals passed the Ebacc last year, while 10.7 per cent had faced a permanent or temporary exclusion. We’ve been flooded with messages like these from cross tutors this month - and with good reason. The Tutor Pages, a well established, trusted, site where independent tutors could tout their services was - with no warning - taken over by French-based ‘Superprof’. Gone were the testimonials and carefully curated profiles. In came a charmless website, error-strewn listings and easily hackable passwords. With no warning to the hundreds of tutors on its books, and families who relied on the website, it looked as though the creators of The Tutor Pages had taken the Superprof money and run. To the tutors who raised the alarm and told us about the takeover, thank you. We rely on you - and parents - to keep our renowned reviews of tutor agencies sharp. If you haven’t seen our tutor reviews, you can find them here. We hope that one day, down the line, Superprof may earn a place among them!